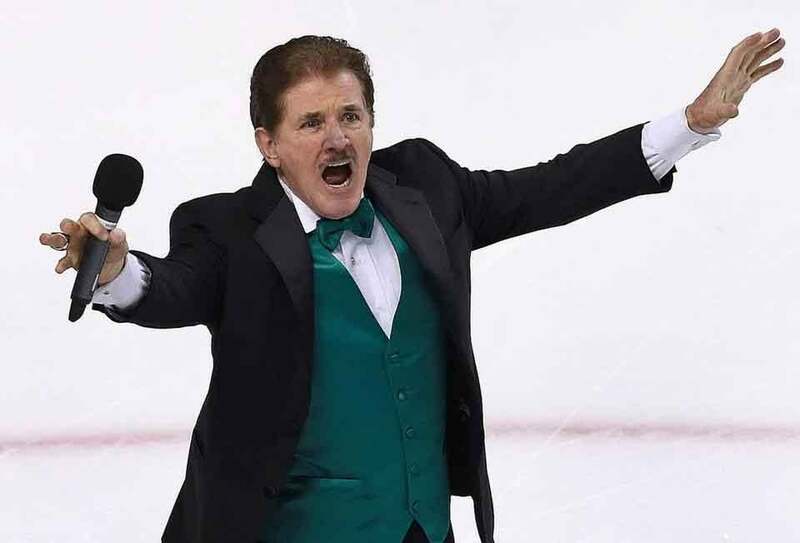 Rene Rancourt wore green on St. Patrick’s Day this year when the Bruins hosted the Sabres. As the final strains of “The Star-Spangled Banner’’ dissolve into the TD Garden’s rafters, the perfectly coiffed man on the red carpet delivers his signature salute and then — we know it’s coming — executes his traditional fist pump. I always thought I knew what Rene Rancourt was conveying by that iconic gesture he’ll carry with him Thursday night as he begins his 40th season singing the national anthem before the Bruins’ first home game of the 2015-’16 season. But I was wrong. I will get back to that. First, let’s consider the remarkable career arc of this man, who has secured his place among the beloved-but-ancillary figures in Boston’s sports pantheon. People such as organist John Kiley, Fenway public address announcer Sherm Feller, and the Celtics’ legendary play-by-play man Johnny Most, who sat high above courtside among a sellout crowd of 13,909. Luck — and not an inconsiderable amount of talent — has followed him since he was drafted into the Army in 1963, when his dream of making it big in Manhattan flamed out. Rancourt saw a notice on a bulletin board at Fort Sill, Okla. The US Army Chorus needed singers. He raised his hand and sang his way through his tour of duty. In 1969, he won first place in the New England Metropolitan Opera auditions, a competition that was broadcast on the radio. One of the listeners was Kiley, the organist at Fenway Park and Boston Garden. With that, a career was launched. No, he couldn’t. So he became a society orchestra leader, which transformed into what he does now when he’s not at the Garden: About a dozen times a month he’s an “invited wedding crasher,’’ singing for brides and grooms as well as at birthday parties and bar mitzvahs. “I’m a ham,’’ he said. “You put me in front of three people and I’ll start telling my jokes.’’ Stop him if you’ve heard this marital repartee: “Remember, you married me for better or for worse. And my wife will say: ‘Yeah, you couldn’t have done better and I couldn’t have done worse.’’ Rim shot. Rancourt greeted me at his door in his workout clothes and he was headed for the gym later that morning. He looks terrific. He asked me to feel his biceps. The guy’s in great shape for his age. And it’s his age that leads me back to what’s behind those fist pumps. Turns out Rancourt has been fibbing about his age over the years. He turned 76 in August and wonders if he’s overstayed his welcome. “To me, it’s anathema to admit your age because people pigeonhole you right away,’’ he said. “The minute they hear ‘76,’ they don’t just hear ‘76,’ they hear — ‘and washed up.’ That’s why the pump is so important. Because the pump is for me. I’ve never admitted that before to another human being, not even my wife. Rene Rancourt washed up? I don’t think so. Do me a favor on Thursday, Mr. Rancourt. After you’re done singing, “O’er the land of the free and the home of the brave,’’ after the salute and the fist pump, look around. And then listen closely. That roar you’ll hear is a return salute from your Garden family.